ASUS has started to ship its Designo Curve MX34VQ display that was originally announced in mid-2016. At present, a number of retailers are offering pre-orders on the monitor, starting that it is “coming soon." The monitor is based around a UWQHD-class panel and is equipped with a wireless Qi charging device as well as an audio sub-system co-developed with Harman Kardon. In addition, the display has a 100 Hz refresh rate, a feature that should appeal to gamers. 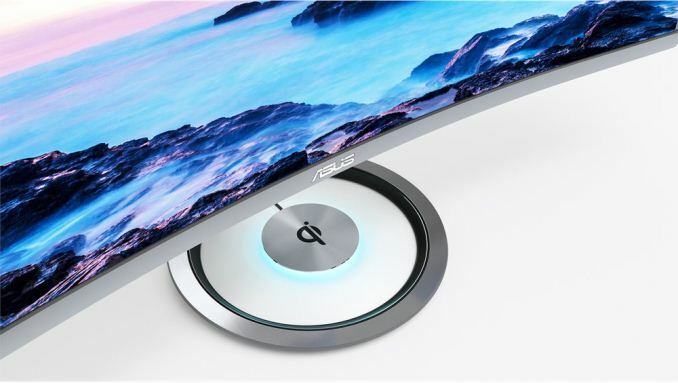 The ASUS Designo Curve MX34VQ has a number of similarities with another ultrawide curved display with a Qi charger, the MX38VQ, which was introduced earlier this year. The two monitors share many design elements, such as ultra-thin bezels, a Harman Kardon-developed audio sub-system consisting of two 8 W speakers, a curved stand made of metal and plastic, and a Qi charger with acrylic elements and blue lighting. Where the two displays differ is in their panels, curvature and other specifications. 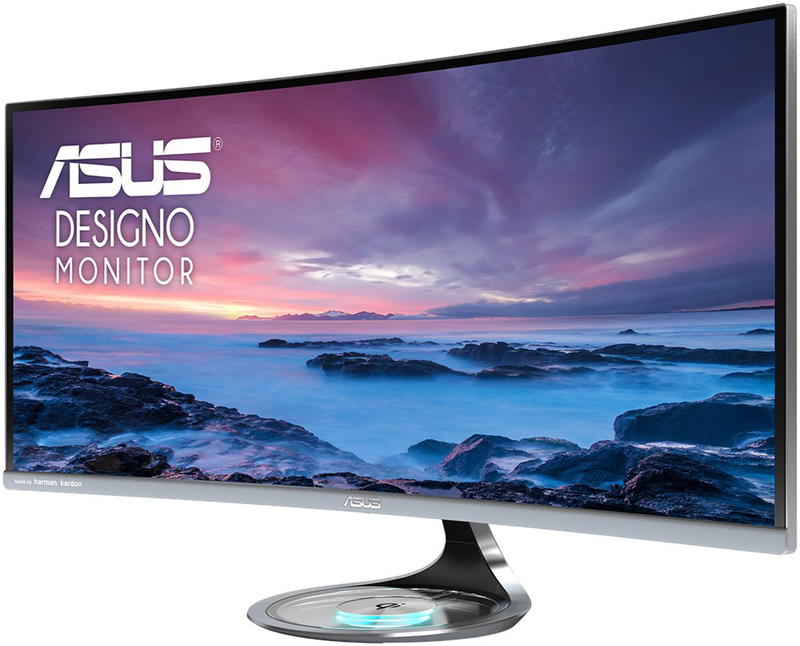 The ASUS Designo Curve MX34VQ is based on a 34” VA panel with a 3440×1440 resolution (2.39:1 aspect ratio), offering a maximum brightness of 300 nits, a 3000:1 contrast ratio, a 100 Hz refresh rate, 178°/178° viewing angles, a 4 ms response time, and 1800R curvature. The panel can reproduce 16.7 million colors and appears to be a pretty typical sRGB gamut design. As for connectivity, the Designo Curve MX34VQ monitor has three HDMI 2.0 ports, a DisplayPort 1.2 port (PiP and PBP functions are supported), and a 3.5-mm audio jack. 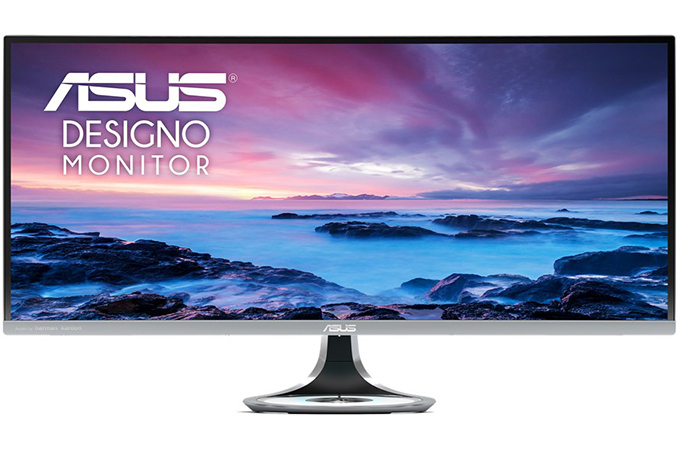 The ASUS Designo Curve MX34VQ can be pre-ordered from Amazon and B&H for $799, which seems to be its official price. If that does end up being the official price then it'll be a bit lower than I had initially expected, given the stylish design and rather decent specifications. For comparison, similar curved ultrawide monitors without Qi support have tended to retail for $899 and higher. In any case, the exact availability date is unknown, but with pre-orders opening up it's reasonable to assume that the MX34VQ will finally hit the shelves in the coming weeks. Smh Asus, no Vesa Mount=No Buy. Huh? Qi Chargers would last as long as the monitor. No reason not to.